82 year old Sarasota resident and Stage 4 cancer patient will fulfill a dream in New York as she models on the SMGlobal Catwalk during New York Fashion Week with non-profit organization, Say YES to Hope and their signature program, "Surviving in Fashion." Sarasota, FL, September 01, 2018 --(PR.com)-- For the 6th season, Say YES to HOPE is bringing twelve advanced cancer patients to New York City for the SMGlobal Catwalk on September 9, 2018 from 6pm–9pm during New York Fashion Week at The Watson Hotel. 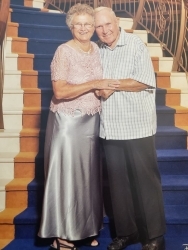 Violeta Packauskas, an 82 year old Sarasota resident, who will also celebrate her 53rd wedding anniversary in New York, and Stage 4 Cholangiocarcinoma patient will be a featured survivor model along with eleven other terminal cancer patients from around the country. Cancer came as a shock for Violeta and what an experience it has been. She and her survivor husband (colon cancer, 2004) decided day one to fight, and fight she has. Several rounds of chemo later, two SIR-Spheres treatments for her liver tumors, and now back on chemo, she is still fighting. When first invited in May, Violeta had no idea what September would bring. September is here and so is she. Together, YES, SMGlobal Catwalk, the designers and patients are making a difference in the fight against a cancer topic that is not often discussed. SMGlobal Catwalk will bring great awareness in heartwarming fashion. Violeta says, "I am 82 and the fashion show has given me a reason to look forward and plan. I’m going to show the world that if at 82 years old I can live with cancer and chase dreams, you can, too! All the excitement and fun of wearing a designer gown and jewelry created especially for me seems unbelievable. Pinch me! Experiencing how real models feel when they strike their pose on the catwalk at my age, a dream come true!" All of the patients come from across the country and will show that a disease that once carried a certain death sentence now has resources, options, and support. Samina Mughal, President and CEO of the Catwalk states, "The 'Surviving in Fashion' showcase is a beautiful tribute to cancer patients and a wonderful way to witness fashion and philanthropy meet." Modeling the wonderful designs gives these patients a chance to shine, to be pampered, and to escape the ravages of treatment while sharing time with others that have a similar diagnosis. "We are so appreciative that Samina continues to give us the chance to not only share our message with the fashion industry, but to give us a once in a lifetime experience on the runway," said Suzanne Lindley, co-founder of YES! who herself is living with terminal cancer. "Bringing awareness to the fact that we are living with cancer, and not dying from it is a huge opportunity. For Violeta to model as an octogenarian and a cancer patient who has embraced treatment, provides even greater hope to those who are facing a similar diagnosis." "It is a cause that is near and dear to my heart. We are pleased to be able to support YES! and to back this worthy charity," says Samina Mughal, founder of SMGlobal Catwalk. To purchase tickets to SMGlobal Catwalk visit SMGlobalCatwalk.com or call 877-937-7478. YES! is a non-profit organization that was created to provide information, resources, and support for anyone that is affected by advanced cancer that has spread to the liver. For more information visit www.SayYEStoHope.org or call the Survivor Line at 877-937-7478.